GULFPORT -- The phenomenon of new born or stillborn baby dolphins washing ashore from the Gulf or the Mississippi Sound continued through the weekend and today. The total in Mississippi and Alabama alone is 36 calves and eight adults or young adults, as of mid-day today. 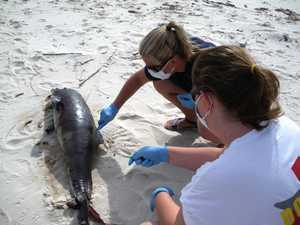 The number is higher, if you include all four of the northern Gulf states effected by the BP oil spill. But researchers in Mississippi and Alabama that are concerned about the sharp spike in the number of dead newborns along the coasts of the two states before the birthing season for dolphins gets fully under way.